An article, featuring YPT, about American players seeking training opportunities in Europe. YPT founder John Fisher is the featured guest of this installment of the weekly worldwide internet radio program. 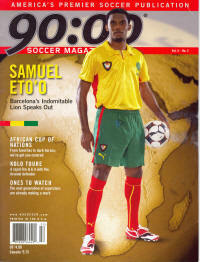 The SOCCER AMERICA article that helped launch it all. In its 'PULSE' segment, 90 Minutes magazines puts the spotlight on YPT player Joseph Gyau and his recent experiences at some of Europe's best youth academies. An article in 90 MINUTES magazine about youth development in America featuring YPT founder John Fisher and the Residence Program. OVER-COACHING at the YOUTH level is POISONING the game for countless numbers of kids in America. Josef Schulz and John Fisher are doing things the right way. Schulz is the director of the Schulz Academy in Boca Raton, FL and has produced a bevy of U.S. youth internationals � most notably Jozy Altidore. Fisher is the director at the YPT Academy in Lancaster, PA whose connections with top clubs in Europe are virtually unrivaled by any other youth coach in the country. More than 10% of the players currently in residency are from their perspective academies, so coaches, start taking notes. 90:00 What is your philosophy to developing young players? SCHULZ: there are different ways to approach this. In general, we try to get players relatively early and introduce them in a fun way to the sport. That�s the first part. The second part is, almost at the age of 14 or 15, we specialize in the development of individual players. Team training in general does not exist in our academy. We really focus on individual development. Not only does the experience show � but 11 good players at the end makes a very successful team because they all can play. FISHER We are trying to raise the level of technical level of the players in this country. Because of the society we live in, with the youth sports culture being so competition driven, a lot of the technical training that young players need is forgotten. Because coaches have players so little, and they�re feeling the pressure from their clubs and parents to win, they�re doing things like fitness. They are doing things like tactics, and they are forgetting the real technical aspects. We�re trying to give young players a much stronger technical foundation. 90:00 How do you help players manage their schedules between club practices and participating in your academy? FISHER We try not to conflict with clubs. A players club may train twice a week and have games on weekends. Players will have maybe an extra two days out of their week when they�re not training with their club team and they�ll participate in programs we run to get better with the things we can focus on. 90:00 What is the biggest gap between youth players here and youth players in Europe? FISHER In bringing our young players over to Europe, we are finding that their biggest weakness is their technical ability when compared to kids their own age. American players are respected for their size and speed. The problem is that club coaches spend to much time on tactics and fitness and not enough time on turning the ball with the outside of the foot or striking a good long ball. As a result, the European club might say, �Well he�s a good athlete, he�s got a good work rate, but technically he doesn�t quite have what he needs, and we don�t have the time to go back and teach him.� That�s a heart breaker. 90:00 Speaking of tactics, are we trying to mold players into specific positions before they�ve even developed? FISHER pigeonholing players in a position early is wrong. You need to let the game be the teacher for a while in a semi-structured environment. When players turn 12 or 13, then you start thinking about position. Until a kid turns 12, you don�t stress position. Just conceptually, the way a child develops their brain, children are just selfish by nature. They want to be in the action. You can talk to a kid about positioning until you are a blue in the face, but once the game starts, drop it. If you start telling a kid, �Don�t go near a ball,� that kid�s going to end up hating soccer. SCHULZ at a young age, and I think this is very important, you introduce the player to many different positions on the field because every specific position has specific basics. An outside midfielder needs to have different basics than a defender. You need to give a player all of the basics tools. When you identify where a player can excel the most, then you need to determine what specific tools that player needs at that position. 90:00 Do you discuss tactics with the players at your academy? SCHULZ The funny thing is, our U17 team won the national Championships three times in a row in the Super Y League, and this team had never had any team training. They have team training by playing matches. IN meetings, we kind of focus on different tactics and things like that, but we never did it during training in seven years. It�s not like we meet at 7:00am on a Saturday to work tactics. At the end of the day, everyone has a certain tactical obligation on the field. But the players understand that because they are all talented players and individually skilled. At the end of the day they just know what to do on the field. 90:00 So how do you go about developing a player from one age group to another? FISHER In Europe, they�re very good at identifying trainers that understand what is necessary at a particular age group. I�ll use Manchester United as an example. Manchester United has hired guys that know how to make things fun. Its actually a part of their philosophy. They firmly believe if a 9, 10, 11 or 12-year-old player isn�t having 100% fun in his development and training, he will never become a complete player. They make the work a lot of fun, but they are still getting the job done. That�s the philosophy we try and implement in our academy. 90:00 What are your thoughts on U.S. Soccer�s youth development academy? FISHER The age groups they are developing are to old. I would say that if they were putting the same emphasis and enthusiasm towards younger age groups. They�re saying the right things, but they are only talking about two age groups (and it�s two of the oldest age groups). To me, that�s a complete waste of time. At 16 or 17, technically speaking, a player is what he�s going to be at that point. You�re not going to do a whole lot to change that. If they were imposing those guidelines on a lot of the younger clubs, that�s different. Everything they are saying is right, but if you don�t apply it to the age groups that can really benefit from that type of philosophy, it doesn�t make any sense. 90:00 What are some of the redeeming qualities to the USSF�s developmental academy? SCHULZ When you play normal, local soccer, you always have opponents that have some weaker players on the team. And then the whole speed of play of the game slows down because of this. What I�ve really liked in the opponents we�ve played is that all of the players on the field were able to keep a certain intensity. That really makes the games much faster, which trains the players to think faster. The important preparation for pro soccer. 90:00 Do you think that there is to much emphasis on structured training and not enough kids getting out and just playing? FISHER One of the things that we stress is that they have 90 minutes, maybe 2 hours to go out and get whatever they need to get done in training. But no matter what happens in that session, for the last 20 minutes, it has to be nothing but playing. I�m talking about just splitting the kids up, letting them play, and the coach has nothing to say to them for the last 20 minutes. You have to get to some point in your session where you say, �Enough. You guys earned it. You guys get to play now.� You�ll never see a happier bunch of kids when you say that.